Get hooked on the art of crochet The crochet craze has taken the craft world by storm. If you've caught the bug and want to take your skills from beginner to beguiling, look no further than the friendly guidance in this bestselling guide. 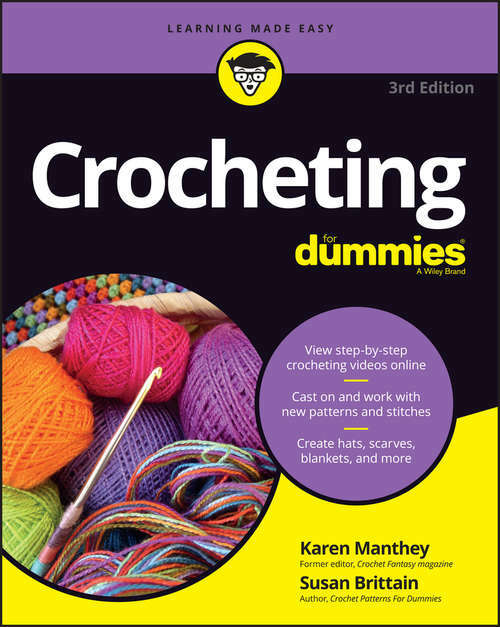 In Crocheting For Dummies 3rd Edition you'll find out how to choose the right hooks and yarns to complete your project, switch colors as you go, utilize varying crochet stiches for different looks, and so much more. Companion project videos will help readers master the concepts and techniques coveredin the book. Julia Roberts and countless other celebrities are doing it--and you can, too! Taking the intimidation out of the timeless art of crocheting, this updated edition gives crafters of every skill level the knowledge and know-how to choose the right tools, create basic stitches, and finish off your work to make beautiful pieces of art. From learning to create consistency with gauge swatches to decoding patterns, symbols, and diagrams, this easy-to-follow guide is all you need to create beautiful designs in no time! Includes fresh new patterns, stitches, and techniques Covers common crocheting mistakes and how to correct them Provides guidance on crocheting with eco-awareness, like working with organic yarns, tie-dye yarns, and free trade and sustainably sourced fibers Gets you up to speed on resources and events held within the crochet community Whether you're a first-time crocheter or looking to expand your skillset, Crocheting For Dummies gives you everything you need to get hooked like a pro.